Some use full links that I have run across, thought it might help some people with different issues. What are your secrets? To quote Blazing Saddles' Howard Johnson, "it's my privilege to present a laurel and hearty handshake." WOW, you mean I got something right. What do I win? How about the insurance deductible for my nose job next week. And speaking of the nose job, I'm going to need a lot of Cetaphil Facial Cleanser to get off all the concealer hiding my bruised face, lol. Since this thread has worked it's way back onto the most viewed list again, I thought I'd do an update. I tried all the products that were suggested (at least the ones I could find) and all of them worked pretty well. The oils were a bit...er...messy. And the winner is...(drum roll, please)...Cetaphil Daily Facial Cleanser. It worked as well or better than the others, but the main reason I'm using it is availability. My local drug stores and high end supermarket carry it. The others I had to get at department stores or online. I like being able to get a product at the same place as I buy vitamins or bread. Thank you, Marsha, for suggesting it. Along with all the other stuff I always carry spare knickers and tights in my bag and I have done for years. (Not the same ones!). I carry them in case of accidents such as snagging my tights, I'll leave any knickers accidents to your imagination! It's a common thing where I live, most girls I know do the same. I think I probably picked up the habit from my older sisters. spose i will have to get another one. rummages for an alternative. perhaps Cass has one, or Julie. Marsha, I would have to go with your second photo there, I really don't have too much and never have. Mostly that is down to my wife having the knowledge that I was lacking at the time, which prevented me from buying 'everything on the make up counter' and then experimenting with it all, lol. So much would have been discarded, or used to open my own counter of course! Even then, I use hardly anything today that I started out with, some of that is down to finding better products, or shades that are better suited to me, while some of it is down to not having the need to cover shadow anymore. Yay!!! A "collection of mistakes", what an excellent term Emma. I imagine many gals feel because they had spent good money for those "mistakes" it makes it hard to discard them. I recall tossing out a lot things a number of years ago, but I really can't give an accurate account of what was included. Some of everything I think. 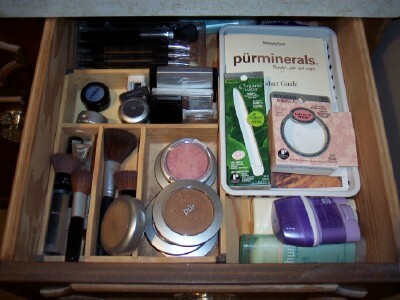 Tammie, as for whose makeup drawers are those pictures of, actually I just got them from Google Images. However I have seen many vanities cluttered with far more than that picture above. The purchase of make up in the early days was as a guy and under pressure, without any real knowledge or understanding. Neither did I initially go out and certainly not in daytime. How things have changed these last 20 months! I am now in a position where I know what works for me and as a result, my current make up collection is probably no more than my wife's, leaving me to dispose of what is a substantial collection of mistakes and now out of date products. Kryolen water based cover set with powder across my beard shadow area and jawline. Through practice and the fact I get out a lot more these days, I can finish my face in 20 minutes, somewhat quicker than the 1 hour+ I took when I first started going out and certainly far more passable. Marsha, I have to agree with Donna, whose makeup drawer is that if you can say. 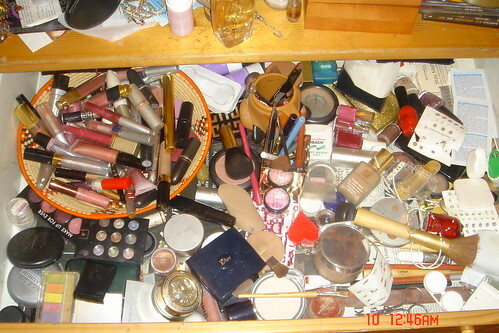 That makeup drawer would drive me nuts....well alright maybe I am there already. All my makeup is organized on a counter top according to what I am trying out otherwise it is stored in a cabinet in my makeup room. An assortment of hair pins and a couple of safety pins...a must...you never know. No knickers...LOL ...I still like to know about that. That's it - though that list is the distillation of a lot of trial, error and disposal over the last year and a half! One of those pictures looks like the "drawer that time forgot." My makeup drawer looks more like the bottom picture....but a much bigger drawer..
Actually Nikki I wasn't after what we wear at one time, but rather what we possess. Do you keep a lot of different makeup items around or have you whittled it down to a handful that you use on a regular basis? Do you discard products you likely will never use again or are you saving everything you have purchased for the day you open your own makeup store, lol? Hmmm, I think the best way to answer this is to go by my day to day items. It takes all of about five minutes to apply in the morning and leaves me looking very natural, which I prefer. Tammy - I have also been known to carry spare tights in my bag, as you can guarantee you are most likely to get a run in them when you are nowhere near a shop to buy another pair! Hummmm, may I ask a question Janis? Yes.... well OK.....why is there such a thing about knickers in the UK...LOL... do you really have a ...quote "Plastic bag with spare knickers and tights " in your shoulder bag. Good point Joanne. Cost is a factor for many of us. I try to watch for coupons for the products I buy. Whether $1.00 off or buy one get one free, I have found the name brand beauty products constantly have coupons available. We have a fabulous Ulta store here with nearly any beauty product you want and they routinely have $5.00 off coupons in Instyle magazine each month. Let's see what my makeup costs at regular price. So that totals $95.37 and figure I have several polishes and probably missed something, so I'm thinking I probably have around $150 worth of makeup. The good news is most of this lasts for quite a long time so spread out over time this is pretty reasonable. I'm almost embarrassed to say I probably spend half that much every month or two on skin care products like Olay ProX Age Repair spf30 daily moisturizer and various other moisturizers and eye firming creams. LOL, do we need to get into shampoo, conditioner, and hair color products also? And where does bubble bath fit in? I think Marsha has an good "uncomplicated" approach that most of the Girls in here would be wise to follow. That doesn't mean we can't have our "special" makeup case when we want to look SPECTACULAR! ....I try a new "look" every couple of weeks. Most of us here did not have the opportunity (or good fortune) to experiment with makeup etc. through our teenage years as most GG's (ovarians) did - so a little "Catching up for lost time" is not unreasonable. I'm really impressed with the responses. There is Tammy on one end of the spectrum and Janis on the other. Reading through Tammy's made me realize I forgot to mention the very light mineral concealer I use on the inner corners of the eye to hide the dark circles and make the eyes pop. My everyday daytime look for my eyes is pretty simple, I use a little light concealer on the inner corners, followed by liner on the upper lids, then liner on only the outside quarter of the lower lash. Then I use Maybelline Great Lash mascara. Notice, no eye shadow. For daytime events like church I apply a lilac shadow on the lid with a medium brown in the crease, followed with a off-white under the brow. Then I fully line the upper and lower lash lines. And again I stick with the Maybelline Great Lash Mascara. For evening socials I will use the same colors along with using the pencils and a little lilac under the lower lash to create a smokey eye look. And again I stick with the Maybelline Great Lash Mascara. I like the mineral foundation for everyday wear as it holds up well for me in the hot summers here in Georgia. I recently decided to try the CoverGirl Simply Ageless foundation probably because all the pics of Ellen Degeneres looked so good. I wrote a review here in the makeup forum. I am very pleased with the coverage and overall look of this foundation. It takes a little more work so I save it for the special events rather than use it daily. I follow the CG creme foundation with Maybelline translucent mineral powder. I use mineral blush just because, lol. It seems to work well for me so why bother changing. I rarely where lipstick. Most often I wear CoverGirl Wetsticks in a plum color. When I do where lipstick I tend to go with a Revlon peachy pink colored one. I've been doing my make-up for so long I think I could do it in the dark. But I'm not going to try it so relax. I'm afraid you're stuck with me. I have my dressing table top set out so that every day I can do the exact same thing in ten minutes flat in this order. It used to take an hour. Boots No7 Anti wrinkle moisturiser, face and neck. Maybelline Vanilla Rose Mineral Foundation, all over face with floppy(ish) brush. Maybelline Golden Sand Mineral Foundation, just on chin and nose to minimise them, also on neck. Boots No7 Soft Apricot Blusher (pink actually). Boots 17 Shine Control Loose powder, not really needed but blends the blusher really well. Max Factor Lipfinity Lipstick, stays on all day really well, range of colours to suit whatever clothes. Boots No7 Deep Brown retractable eyebrow pencil. (Whilst waiting for lips to dry). Max Factor Lipfinity clear lip gloss. Revlon Matte Aubergine eyeshadow, done smokey. L'Oreal Black Explosion for my upper lashes, (the spiky ball brush works better). Sometimes Maybelline Golden Sand Mineral Foundation for cleavage, dependant upon neckline. Not to much really compared to some other girls I've seen. But of course I can't get out the lippy & mascara without doing a repair job. So if you'll excuse me for a few minutes. Wow Marsha, you have really put me on the spot here, and not sure how to start. But I am combining two post here in one, easier for description. Now don't chuckle to much. But I am about much. Do I use it all, yes at different times, but it is understood that I do not go over board on makeup, but I like dramatic, not thick. I am the type that likes to try different types of makeup, and applications. My foundation is by Prescriptive's ( they are out of business now) Which I have blended for my skin type. This required a skin test at the store. My cosmetic specialist now works for Channel and she said she can match it up. I bought enough to last a while before they went out of business. Foundations....I do have several...I experiment. There used to be a process that required a triple layer, each one buffed down and darker with each shade...I learned this from a makeup artist, it works quite well but takes time.....but I do not use it any more. Setting powder, again several...from translucent to pink to an ageless cover. Smash Box Halo Perfecting powder Light, my favorite. Reason, for this...you just turn the inside ring and it scrapes off a fresh setting powder off a compressed cake, and you can get just enough. Five lip liner pencils ...again depends on color. Lipstick...OMG a bit of a fetish here, and not enough fingers. I do like to combine at least two different colors to get my desired shade depending on my mood, nails, and clothes. Eye shadow..I am impossible here, to many to count. My main look is a dark smoky winged look. One black eye pencil, three cream liners, four liquid eye liners...again I like to experiment, but I do write down what I do so as to replicate it if I like the result. Two types of whitish cream shadow, for the inner corners of the eye.. makes things pop. Yes I am a bit of a fanatic, when it comes to makeup. But I like to be on the edge, and don't ask me what edge...I am still trying to figure this out. Bronzer's...three, color is dependent on time of the year. Shimmer powder...ha, one..wow you probably thought I was getting obsessive. Bisque..by bare minerals..great to cover those little pesky spots that pop up. Nail polish...now..my wife and I share several different colors...what does several mean...many of course, you know this by now. Brushes...my makeup counter looks a bit like I am doing a portrait..I like brushes, and I am a tad fussy. But now, if I travel, I can pack lightly, for I know what works well for myself. Do I dare go on, I think this covers it.......I have many different types of techniques, I prefer just a few now, some I forgot..senior moment, I can say that. Karen Brad made an interesting comment in her blog about having bought too much makeup at one time. I know everyone has a learning curve as to what works best for them so we may have lots of makeup we likely will never use again. My work happens to take me into hundreds of households each year and I see everything from counters filled with makeup to a single lipstick dispenser. So I'm curious as to what others like to keep around. There is no right or wrong answer here. I keep things really simple. I have two mineral powder foundations and one cream foundation for special occasions. 1 translucent powder to set the creme foundation. Maybe 6 nail polishes including clear. My favorite is OPI Helen of Troy, kind of a peachy pink color. I'm trying to let new gals know that they don't need a suitcase full of cosmetics. However there is nothing wrong experimenting with lots of different things. Just don't forget they recommend replacing cosmetics periodically. Last I read mentioned up to 2 years for foundations, powders and lipstick. But only 6 months to a year on eye makeup for health reasons. Well, I have now tried there studio eye shadow, charcoal, very impressed. Nix, the liquid eye liner. The eyebrow kit works as well as Benefit. I will be trying there lipstick this weekend, in cheerful cherry, fiery fuchsia. In a brief trail effort, it seems to apply just like the name brands.But I also use there lip lock pencil, to prevent feathering. My wife likes the Makeup remover cleansing cloths, just like some name brands she buys but cheaper, I mean inexpensive. Well post more results when I am convinced about there value. Foundation, eye-shadow, little bit of mascara and lippy.